I recently trimmed the Ruby Roo myself for the first time. 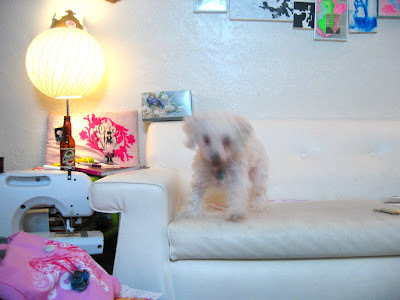 She is a bichon frise who is hypo-allergenic (thankfully! ), but that means that her hair grows like human hair and has to be cut every so often. It's very expensive to trim her breed, since their hair gets matted so easily, and I'm never too happy with how she looks when she gets back. The typical bichon cut is a huge lion's mane looking thing around the head, and no matter how many times I ask them not to cut her this way, I still get a baby lion when I go to pick her up... I'm so glad I didn't end up making her look crazy, and I know she is so much more comfortable with me than some stranger who wants to poke and prod at her. Hello! I was just browsing your blog and noticed your photos. 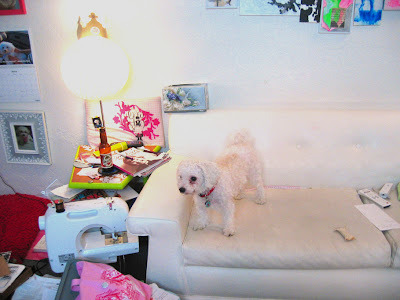 I really like your lamp and doggie; actually the whole room looks really fun!